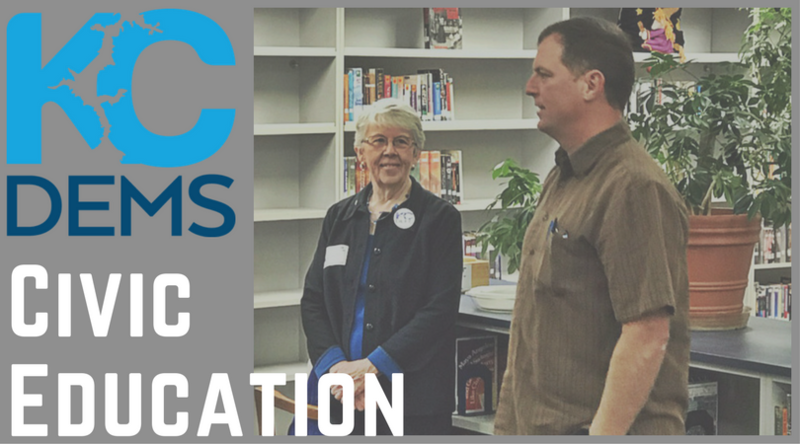 One of the many tasks I do as Chair of the Kootenai County Democratic Central Committee is to accept speaking invitations. 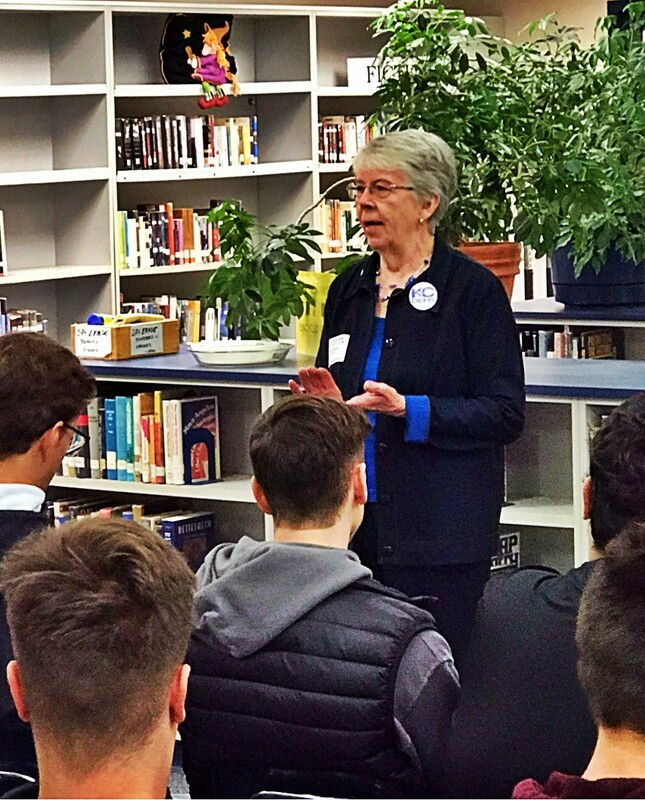 For the past eight years in the fall, responding to an invitation by Mr. Brian Holgate, I have spoken to the US Government students at Coeur d’Alene High School. (A spokesman for the Kootenai County Republican Party is given an equal opportunity.) Last Wednesday, I had a captive audience of about 300 students of Mr. Holgate, Mr. Walters, and Mr. Borowsky. I fielded questions for about six hours. Each year I plan a way to talk about the values that initially drew me to the Democratic Party; each year I have taken a different approach. This year I decided to use a document that all political parties in the US seem to respect and reference: The Constitution of the United States. 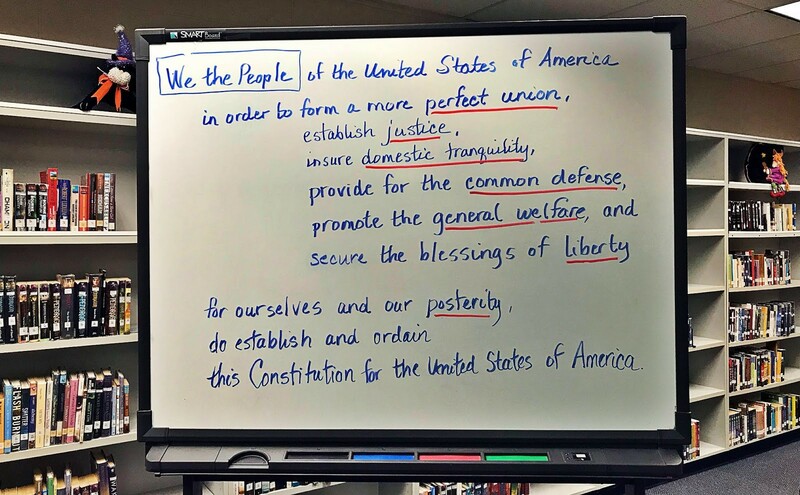 From memory, having learned it by heart when I was in high school, I wrote the Preamble of the Constitution on the board and underlined the values embodied there. Thereby I was able, after introducing myself with my “credentials” as a former teacher working with “difficult” teenagers at Anchor House/Idaho Youth Ranch, to summarize the values we all hold dear. We have common values I emphasized; the difference between the two major parties is in the way we try to work to achieve those values, or in the emphasis we place on those values. For example, the Republicans may work more toward “providing for the common defense” of our country; Democrats may emphasize “promoting the general welfare” of our citizens. After one class a young man, Ben H., who identified himself as a Republican thanked me for speaking there and said he really liked my ideas about values. He concluded that maybe he was an independent. I try to highlight two other things in my talks: the importance of voting, especially in local elections, and the opportunity for leadership by involvement in a party’s central committee. I pointed out that, while a single vote is one of a great many in a presidential election, one person’s vote is one of relatively few in a local election. For example, just a few years ago in Post Falls, a school board candidate whom I supported lost by eleven votes. If I had made just a few phone calls, I maybe could have effected a different result. Another time a Coeur d’Alene city council candidate won by only five or six votes and was challenged in court by his losing opponent; the outcome of the court case was that the original winner won by only three votes. Think of the power of those three votes! Another example is my own vote for a successful school board levy election was literally worth $2000 to the school district! As for finding leadership opportunities, I emphasize that precinct committeeperson is an elected position, one very easy to win, especially if you have no opponent, which is a common situation. Very often there are numerous appointed positions within the central committee which afford multiple opportunities to take leadership roles and to learn many marketable, resume-building skills. I assure them that they are most welcome to visit and join the work of the Kootenai County Democrats! A second young man named Walter asked me for further contact information so he could possibly get involved (he can!) even though he isn’t quite eighteen yet. The remaining time in the classroom is spent responding to questions that the students were encouraged to develop, with the admonition that this was a time to learn about the Democrats, not engage in debate. I have tried over the years to be very open to any question. The questions usually started with the words “What do you think about. . .” and related mostly to national issues. Heeding their teachers’ advice, the students for the most part avoided direct questions about the President. The one asked, I answered using the same statements I had included in a Letter to the Editor shortly after the election: We will give him a chance. But now he has proven to destroy things, not build things. I also stressed our sincere attempts to understand why his voters supported him. The experience is somewhat heady when asked something like “What should be done about North Korea, or ISIS?” The anticipated question about immigration prompted me to bring out my props, two pie plates—one small, one large– which I used to illustrate that immigrants do not necessitate our dividing limited resources (the small pie) into smaller and smaller pieces, but rather, help increase the size of the pie so that everyone gets an ample share. We benefit not only for their work in jobs which mostly we will not do, but also from their rich cultural contributions to our county. Since I will no doubt NOT be the Chair after next year’s primary when we reappoint our Central Committee officers, I will reluctantly pass on this task to the new party Chair. Besides the two boys mentioned earlier, two other students came forward afterward to thank me for coming to their classes. The next Chair is in for a great time!